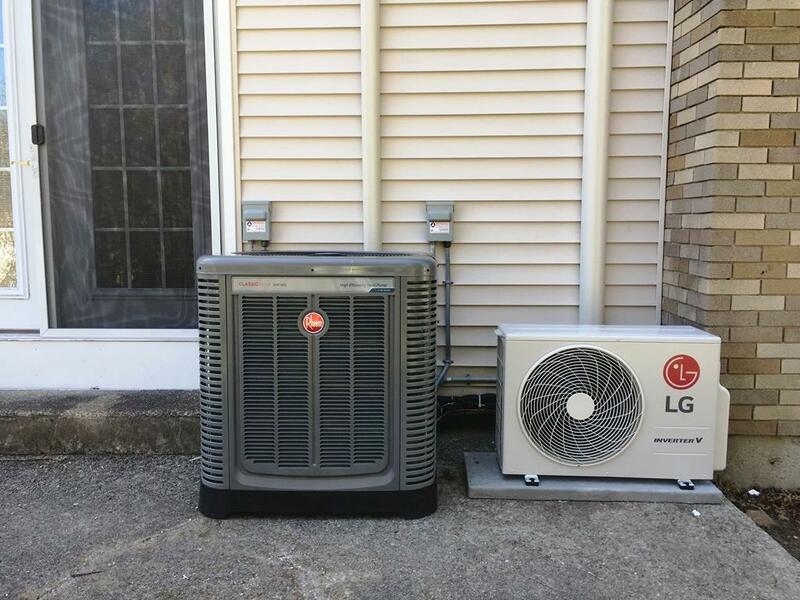 Affordable Heat and Air Company provides complete professional heat pump repairs and services to the Lowell, MA residents and also for surrounding areas. Our services range from regular maintenance and repairs to installation and sales. We have EPA certified professionals who are expert in heating and cooling systems, thus keep your home comfortable and safe throughout the year. We also reduce the energy bills by offering high SEER equipment and maintenance plans to make sure that your unit functions at peak productivity for several years in the future. Affordable Heat and Air Company performs numerous excellent quality heat pump units to heat and cool your house effectively. The heat pump utilizes heat dispersal systems to perform double duty. It allows the interiors of the home to be cool and comfortable and also use only limited energy when linked with the traditional air conditioner systems. It is best to change to the heat pump that would vastly limit your monthly energy expenses, particularly in the summer. The Seasonal Energy Efficiency Ratio or SEER rating tells the level of energy you require to use to heat and cool the property. At Affordable Heat and Air Company, we have various types of units that suit all kinds of budget. We have units with SEER ratings differing from 10.0 to 17.9. What’s more? Know the benefits offered by the highly efficient SEER equipment and choose the right equipment for your property. At Affordable Heat and Air Company, we take an extra step to make sure that the equipment functions properly and remains functioning for long years without any issue. Generally, the life of the heat pump is about 15 years. When you care and maintain regularly, you can save money in terms of repairs and services. It also offers with uniform heating and cooling throughout the lifespan of the system. Just like other HVAC systems, it is necessary for regular maintenance. It is mandatory, and it helps the system to function optimally. Our experts would ensure that the entire AC unit is maintained clean and functions excellently at peak efficiency. Call us now regarding affordable and best maintenance plans we provide. We also offer additional benefits for long time customers of Affordable Heat and Air Company. When there is a problem, you would immediately think about approaching an expert for a solution. Well, it is best to call Affordable Heat and Air Company anytime for all kinds of issues you are facing due to the heat pump. We are best in Lowell, MA for performing heat pump repairing job. We aim to make your system back to running position immediately and make your house cool and comfortable living space. No matter, you approach us during the morning or late evenings, you can entirely depend on our experts for fast, reliable and trusted service. Another most important thing is that you do not have to care about expensive late hours working fees. We work round the clock, and we would not charge additionally when you call any time. The charges are the same when you call in the night hours, during morning hours or on the weekend. In most cases, we get calls from homeowners for the issues and problems that can be fixed. So, before calling for an appointment, ensure to check the following things. What is the status of your heat pump? Is it functioning or not working? Check the fuse and thermostat or breaker for the unit are working correctly. What is the status of your outdoor unit? Is it icing over? Most systems are designed in a manner where it can defrost on their own. However, still, there are chances of issues in the form of thick ice layers. Ensure to avoid damage and speed up the process by using warm water to melt the ice away. Are you getting high energy bills? Ensure to check the thermostat and see whether the heat pump is set to cool or heat. It should not go with the emergency setting. If you feel that these suggestions do not rectify your issue, you can have to get in touch with a professional and trusted AC technician. Though you purchase the best quality equipment, it will not last for several years. Every equipment and parts have a limited lifetime, and it will perform only until that period. After a point of time, it will start to cause an issue in one form or the other. Once it starts with a small repair, it will slowly develop with numerous problems. It is best to fix a high-performance heat pump with the help of experienced technicians to solve all your requirements. If you wish to know the right option for your needs, you to have to discuss with the leading technicians. By approaching and spending around 10 minutes, you can quickly get a quote at Affordable Heat and Air Company. Moreover, we will also take steps to install your air conditioning system in a few days after completing the booking procedure. Affordable Heat and Air Company is ready to cool the clients with its experienced services and high-end products. We offer solutions for installation, maintenance, and repairs of the heat pump and air conditioners in quick time. We have the necessary experience and tools to make your heat pump function and remain strong. Get in touch with us by calling (978) 667-8122 and get your service fixed today.